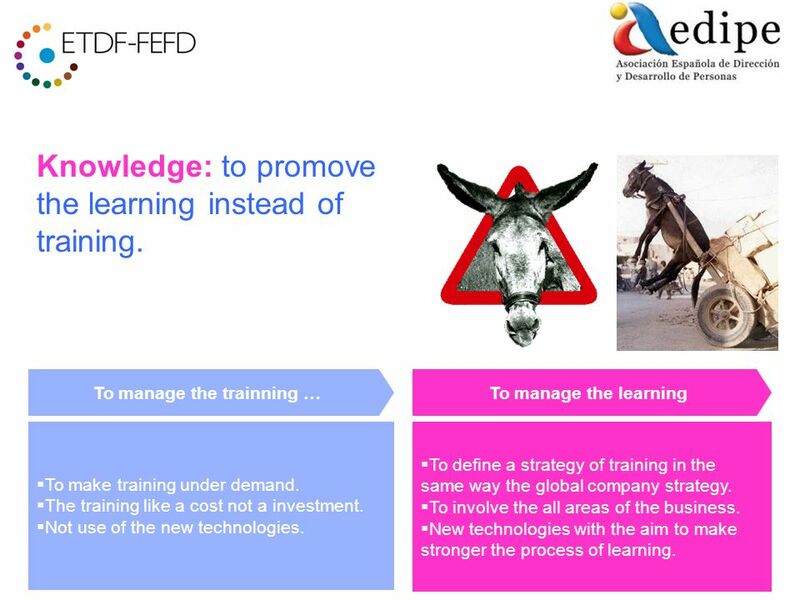 3 Knowledge: to promove the learning instead of training. To manage the learningTo manage the trainning … To make training under demand. The training like a cost not a investment. Not use of the new technologies. To define a strategy of training in the same way the global company strategy. To involve the all areas of the business. New technologies with the aim to make stronger the process of learning. 4 Last news!! 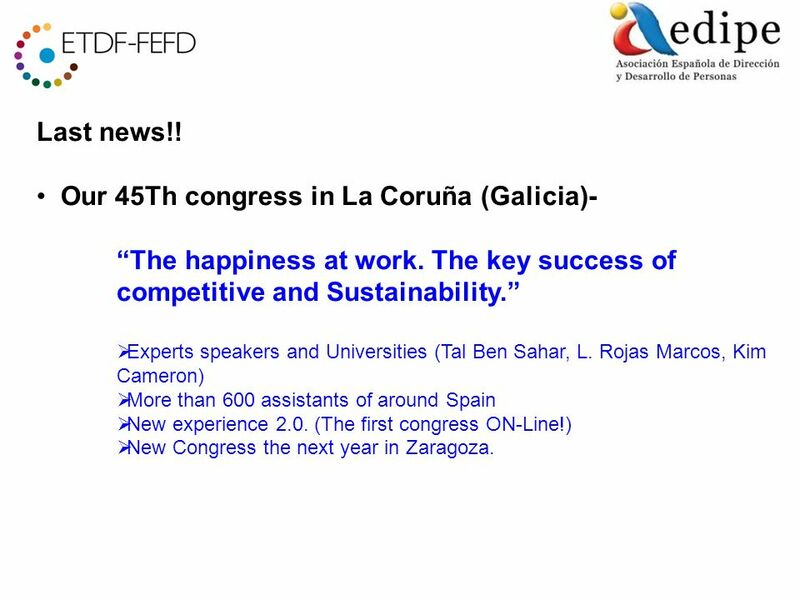 Our 45Th congress in La Coruña (Galicia)- The happiness at work. 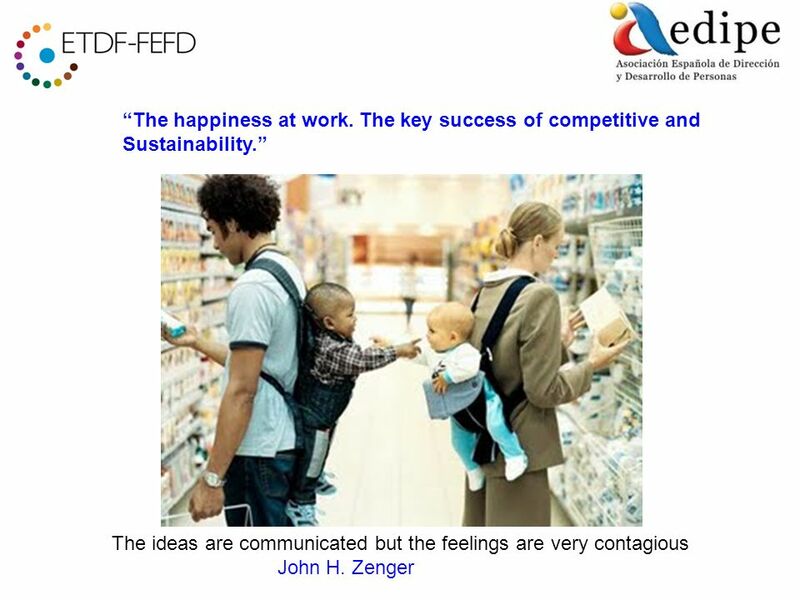 The key success of competitive and Sustainability. Experts speakers and Universities (Tal Ben Sahar, L. Rojas Marcos, Kim Cameron) More than 600 assistants of around Spain New experience 2.0. (The first congress ON-Line!) New Congress the next year in Zaragoza. 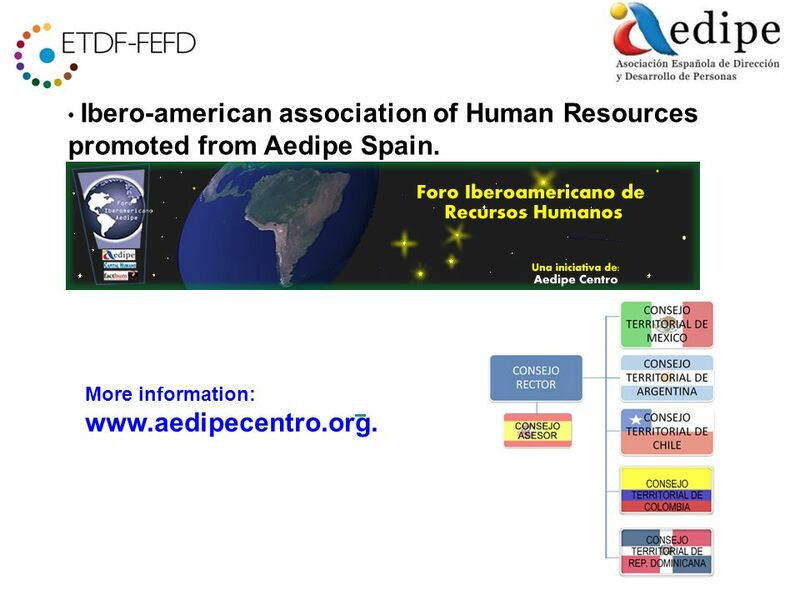 6 Ibero-american association of Human Resources promoted from Aedipe Spain. More information: www.aedipecentro.org. 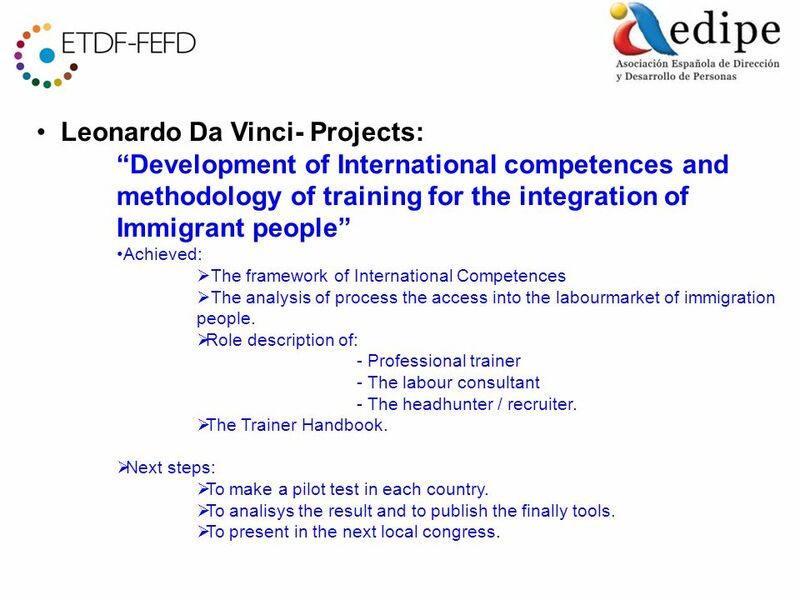 7 Leonardo Da Vinci- Projects: Development of International competences and methodology of training for the integration of Immigrant people Achieved: The framework of International Competences The analysis of process the access into the labourmarket of immigration people. Role description of: - Professional trainer - The labour consultant - The headhunter / recruiter. The Trainer Handbook. Next steps: To asses the tools in the next international meeting 17th Nov. To make a pilot test in each country. To analisys the result and to publish the finally tools. To present in the next local congress. 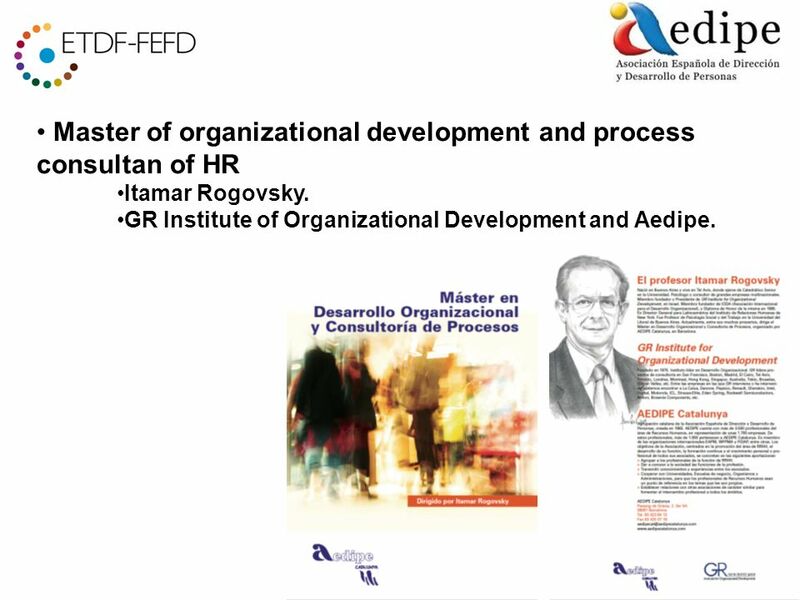 8 Master of organizational development and process consultan of HR Itamar Rogovsky. GR Institute of Organizational Development and Aedipe. 9 Our 46Th Congress in Zaragoza- New ideas to create jobplaces. Personnel and professional Challenges. Thursday 12. Mai D. Valeriano Gómez, Work Minister. N1 Change the mind. D. José María Pujol, Presidente de Ficosa. D. Luis Romero, Presidente de Pívot Point. D. Adolfo Domínguez, Fundador de Adolfo Domínguez (P.C.). N2 New labour rules D. Salvador del Rey Guanter, Socio de Cuatrecasas. Presidente del Instituto Internacional Cuatrecasas. D. Federico Durán, Coordinador Nacional del Dpto. Laboral en el Despacho J&A Garrigues S.L.P. D. Joan Rosell Lastortras, Presidente de CEOE. Discussion with workcouncils-Labour unions. 11 Leonardo Da Vinci- Projects: Development of International competences and methodology of training for the integration of Immigrant people Achieved: The framework of International Competences The analysis of process the access into the labourmarket of immigration people. Role description of: - Professional trainer - The labour consultant - The headhunter / recruiter. The Trainer Handbook. Next steps: To make a pilot test in each country. To analisys the result and to publish the finally tools. To present in the next local congress. 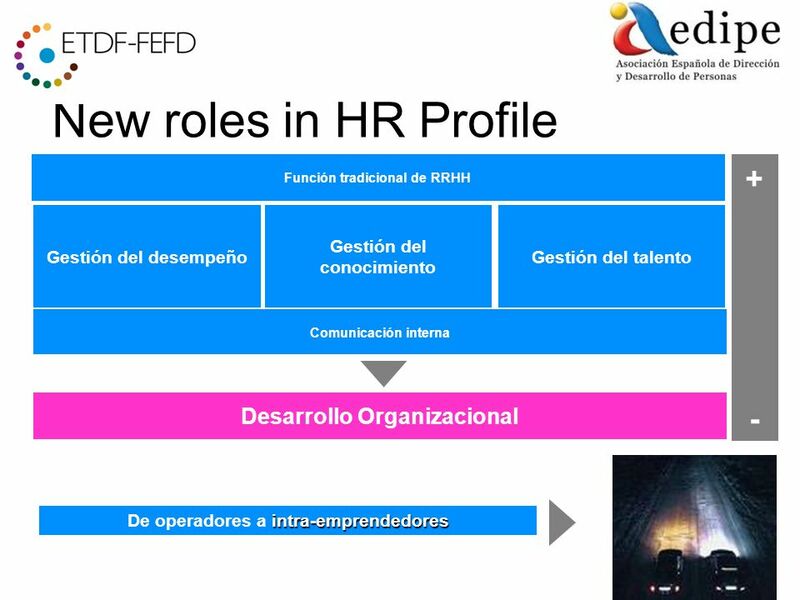 Descargar ppt "ETDF. 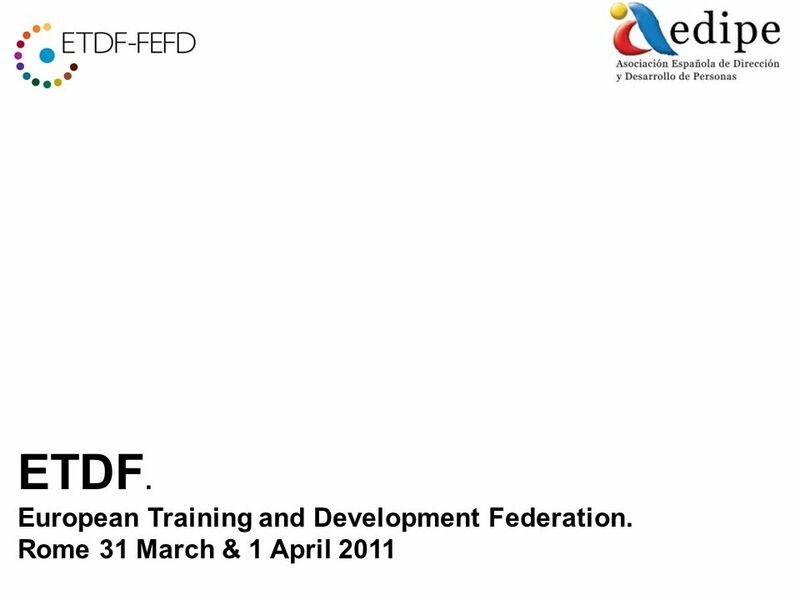 European Training and Development Federation. Rome 31 March & 1 April 2011." La mobilización de recursos privados Claudio Forner Fondos de Inversión en el Clima. Si nce the foundation of the Association in the year 1984 we have been accomplishing social, legal, psychological and work demands, among others of the. Unifying Concepts and Processes in Science. Explanatory Framework Across Science Disciplines Science is a way of knowing, a process--- it is a systematic. Los dias de la semana.